The Library Shop is a non-profit book & gift store located in the courtyard of the Downtown Central Library sponsored by the FSDPL and the SDP Library Foundation. To find out more about the Library Shop, their hours of operation, monthly special events, speakers, books and materials, go to Library Shop or call the Library Shop at 619-236-5802. April 27-29: 3rd Annual San Diego Book Crawl & Independent Bookstore Day. Book Crawl Show your love for local independent bookstores throughout San Diego, by visiting as many as you can (including the Central Library’s Library Shop), collecting passport stamps with every purchase and winning prizes and special discounts along the way. 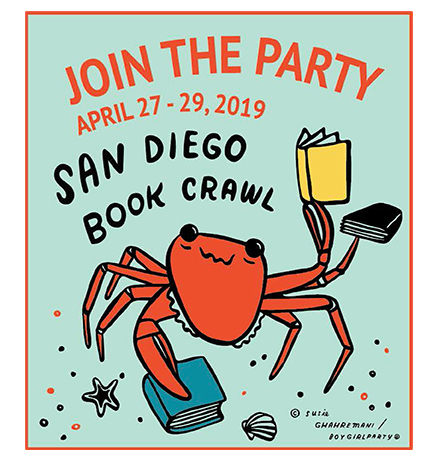 This year’s exclusive giveaways include an SD Book Crawl tote and limited edition enamel pin designed by official SD Book Crawl Ambassador (and nationally recognized local artist) Susie Ghahremani. Your purchases at the Library Shop at the downtown Central Library have always helped support the 36 branches of the San Diego Public Library System, but now they can help support you as well! Simply join our Frequent Buyer’s Club next time you’re in and you’ll receive a $20 Store Credit for every $200 you spend. It’s free, it’s easy, there’s no paperwork & we keep track so all you have to do is shop. Stop by for full details! As the plans for Downtown Central Library were being developed, space was set aside for a Library Gift/Book Shop to be located on site. It features a wide selection of well-curated books, gifts, cards, jewelry, and more. Proceeds support all 36 San Diego Public Libraries. Come see why San Diego Magazine named it the best literati boutique in San Diego. Life-members of the Friends of the Library receive 10% off all purchases. The Library Shop also sponsors monthly special events for adults like trivia games, adult spelling bees, and planting succulents workshops. To find out more about the Library Shop, their hours of operation, monthly special events, speakers, books and materials, go to Library Shop or call the Library Shop at 619-236-5802.